School of Computer Science (SCS) students won three of the four top prizes at Institute for Information Security and Privacy (IISP) Cybersecurity Demo Day. The research showcase was part of the IISP 16th annual Cybersecurity Summit on Oct. 4. Sixteen Georgia Tech student groups entered the IISP Cybersecurity Demo Day Poster and Two-Minute Madness competition for the chance to win a total of $10,000 prizes. These teams are automatically eligible to participate in the Demo Day Program that offers $125,000 in total cash prizes and industry mentorship to help commercialize their work. The final winner will be chosen in the spring, but the summit was the participants’ first opportunity to receive feedback on their projects. One of the goals of Demo Day is to help students get comfortable with presenting their work. 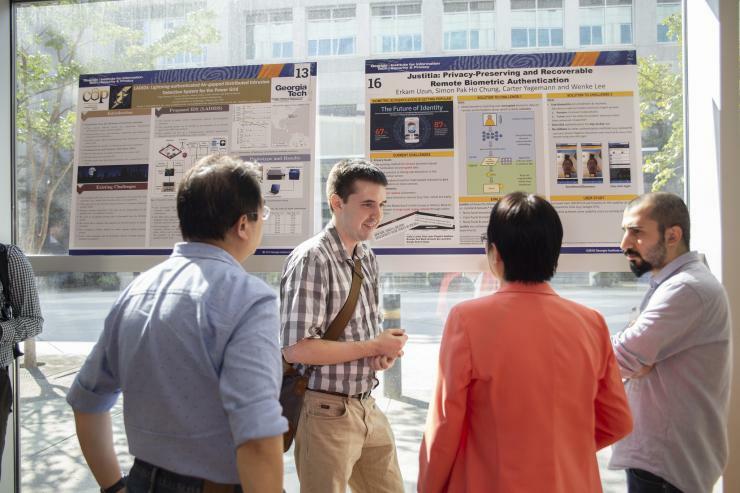 To achieve this, each group presented their research as part of a two-minute madness round during the summit and then participated in a poster session where cybersecurity industry leaders and academics could ask questions. “If you’re doing a Ph.D., you need to be able to do public speaking to get research funding,” said SCS Ph.D. student Carter Yagemann. Attendees voted for the most promising project, which won the first prize. A panel of local chief information security officers selected the other two winners. New this year was a prize for a spot in CREATE-X. Although they did not place in the top three, the other teams are still eligible to compete in the 2019 finale, and can attend a three-month training course on how to commercialize a product. Students who could not attend the summit can still join the program if they email Gloria Griessman. Research Topic: Last year, the team introduced a tool that can replay a cyberattack. Now the team is expanding the tool to multiple hosts to get a complete picture of an attack. Research Topic: Surveys are vital for businesses, but how can a restaurant be sure that a customer leaving a Yelp review has actually dined at the restaurant? This research creates an anonymous survey system with real-time authentication. Research Topic: Expanding off her research on generating a telephone hacking blacklist, now she is focusing on how to overcome caller ID spoofing, where copycat phone numbers look exactly like a victim’s own. Eventually she hopes to build an Android app. Research Topic: Biometric data is more secure than any password, but replacing biometrics every time a user gets a new device is tedious. We need to be able to authenticate biometric data remotely while preserving privacy of a user. The team created a remote authentication server that performs biometric matching over encrypted biometric data.